The feather industry in South Africa started around 1860 and peaked in 1875, the peak was termed as the ostrich feather boom and lasted for over ten years. 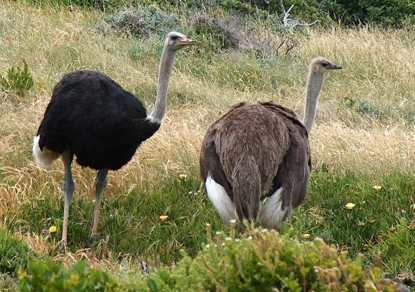 During that time ostrich plumes provided nearly 40 % of the agricultural exports from South Africa. The fashion style from that period accounted towards the success of the ostrich feather trade and included items like feather boa, hats or fans. Export destinations where mainly to the fashion capitals of the world, such as London, Paris and New York. The feather trade slump occurred during 1886 and was due to the overproduction and poor quality of feathers. The second ostrich feather boom occurred during 1897 and lasted till 1914. Ostrich feather farming industry was concentrated in the districts of Oudtshoorn, Grahamstown and Graaff Reinet, with Port Elizabeth as the headquarters of the feather auction and export agents. After 1914 the European market feather market declined and was due to a lack of regulation of supply and the start of the first world war. The ostrich feather market has not regained it's earlier successes to date, but the feathers are today still used for fashion accessories such as beautiful evening dresses and hats. The ostrich feather fashion is especially evident at events like the Rio mardi gras where the mardi gras masks and hats are worn. These evening dresses and head pieces use dyed feathers selected from prime quality feathers and plumes.